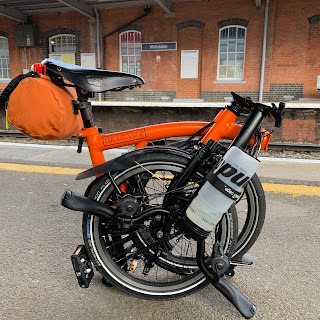 My Orange Brompton: Training and more training for the Brompton World Championships! Training and more training for the Brompton World Championships! Today out of necessity I succumbed to eating a 'KFC Wicked Zinger Box Meal.' We had come back from a week away and didn't have the time or inclination to make something. I have not eaten a 'KFC Wicked Zinger Box Meal' before and I did enjoy it but every single bite brought thoughts of the Brompton World Championships. Watching the Olympics I am sure that Farah, Ennis, Hoy, Pendleton to name but a few did not embark on their Olympic preparation with a 'KFC Wicked Zinger Box Meal.' I enjoyed it. Is that wrong? In fact I thought it was very tasty however with a high there is always a low. By the end of it I felt terrible, dirty, tainted, guilty. Tomorrow the training starts. This includes a much more healthy eating regime. The Brompton World Championships is going to come round very quickly so my training must begin in earnest! Watching the many documentaries about the Olympians training schedules one could get worried as some have taken two years to prepare! Bloody hell...the BWC is on the 19th August! Just means 1 extra lap around Richmond park I guess.